So… the road is a little bumpy so far for this year, getting adjusted to my new roommate and Energizer-bunny-like neighbors. It’s been a lot of fun, but I’m having difficulties balancing fun and still trying to stay on top of class and studio projects. I guess I just need to be more strict with myself… or something. 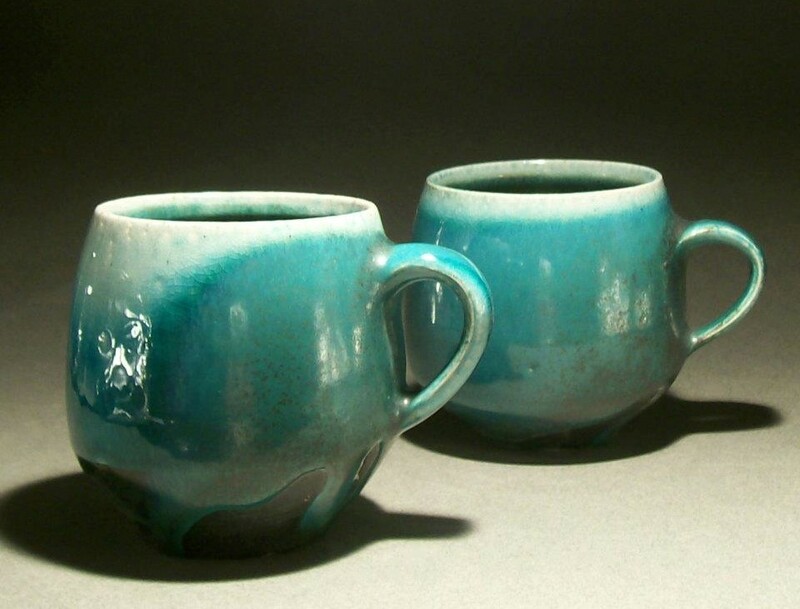 The photo is of a couple of my turquoise oribe mugs. They were the first of my experiments to turn this shape into a mug by adding a really simple handle. These were in that crazy juicy soda firing forever ago. It seems that way. The glaze ran right down over the black slip down to the foot. This entry was posted in Art, Ceramics, Photography, Science, Uncategorized and tagged ceramics, glaze, oribe, soda firing, turquoise. Bookmark the permalink.